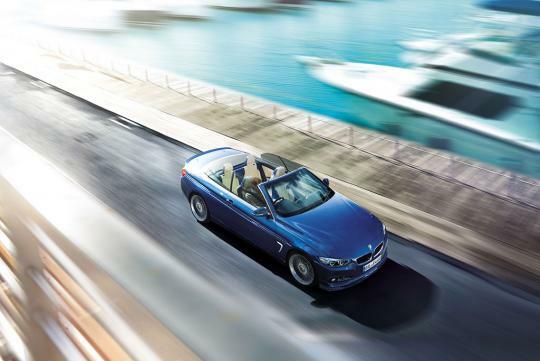 The Alpina B4 Bi-Turbo Convertible is characterised by short overhangs, precise, long drawn shoulder lines, a wide rear and a charming metal folding roof. 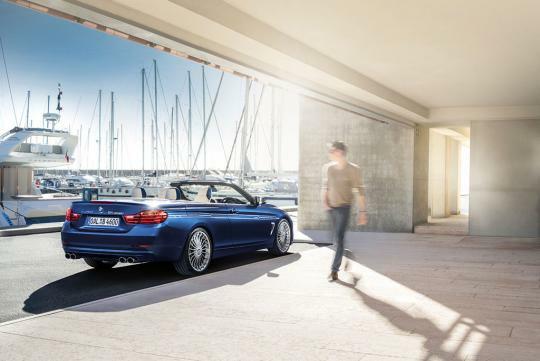 Functional aerodynamics, signature 20-inch Alpina classic wheels and two elliptical double tailpipes are hallmarks of the Alpina design philosophy and lend a particularly elegant presence with the Alpina refined convertible. 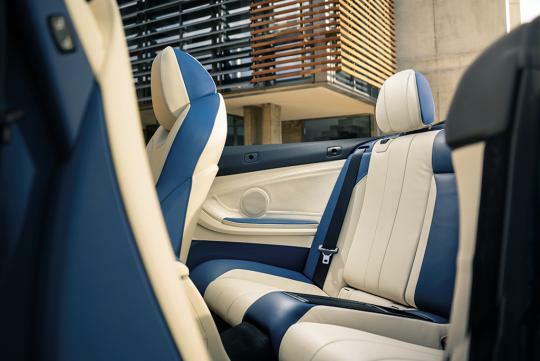 Like the name suggests, the 2,979cc straight-six engine in the Alpina B4 Bi-Turbo is equipped with two turbochargers to deliver 410bhp and a maximum torque of 600Nm. 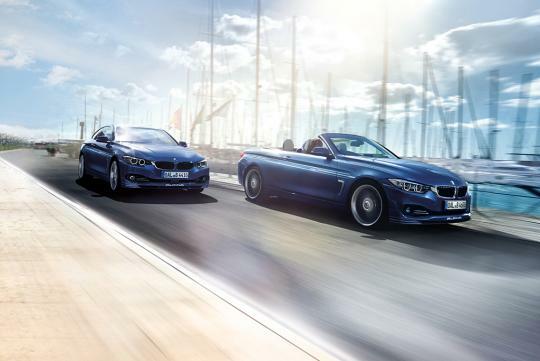 In combination with the excellent ZF eight-speed transmission, the B4 Bi-Turbo Convertible accelerates from zero to 100km/h in 4.5 seconds on its way to a top speed in excess of 300km/h. Braking power is provided by 18-inch high performance brake system with 370mm discs at the front and 345mm discs at the rear. Blue painted aluminium callipers with Alpina lettering, in conjunction with high performance pads, ensure fading stability and optimal pedal feedback. The stainless steel exhaust system was developed in collaboration with Akrapovic and is 7.5kg lighter in comparison to its predecessor. 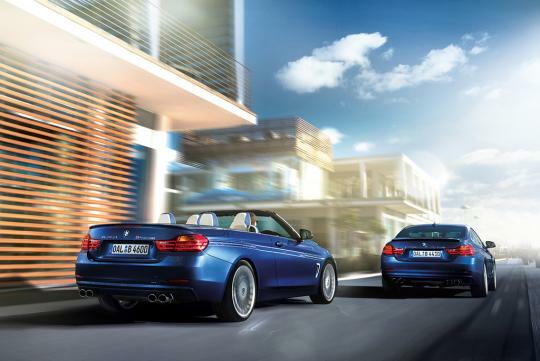 The resonant, sporty sound of the exhaust system is controlled by an intelligent exhaust valve. In Sport Mode, the valve is permanently open and the B4 Bi-Turbo thrills with its distinctive aural character under hard acceleration. 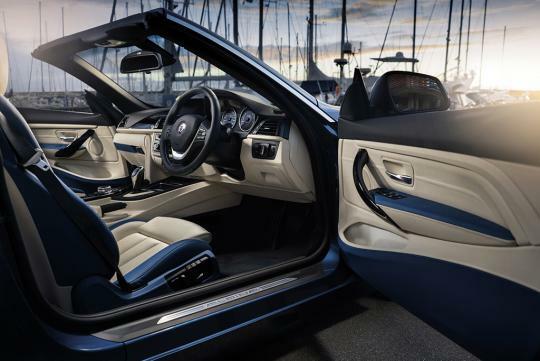 The drivetrain, equipped with auto start-stop and Valvetronic also impresses with class leading economy figures of just 13,2km/L and 177g of CO2. those words behind the boots looks excessive. do they have a logo for themselves?